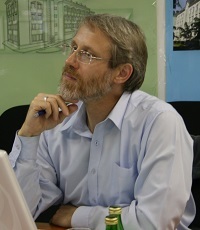 Professor Vasilyuk, PhD in Psychology, Head of the Chair of the Individual and Group Psychotherapy of Faculty of the Counseling and Clinical Psychology MSUPE, Leading research fellow of the laboratory of counseling psychology and psychotherapy of Psychological Institute of the Russian Academy of Education, head of the laboratory of scientific foundations of psychotherapy of the Psychological Institute of the Russian Academy of Education. PhD student of A.N. Leontiev and later V.P. Zinchenko. In 1984 Vasilyuk published a book “Psychology of perezhivaniye” which became globally known. Prof. Vasilyuk was one of the founders of Russia’s first specialized centers of special psychology. In 1993 Vasilyuk created “Moscow psychotherapy journal”. Since 1993 – researcher in Psychology Institute, Russian Academy of Education; since 1994 – head of the laboratory of Scientific foundations of psychological counseling and psychotherapy. In 1997 Vasilyuk has founded Russia’s first Psychological Counseling faculty. Professor Vasilyuk is known for his research in the area of methodology of psychology, psychology of consciousness and psychotherapy. Professor practices individual and group psychotherapy. On the basis of his theory of perezhivaniye Prof. Vasilyuk developed a system of “Understanding psychology”. This approach is notable for detailed psychotherapeutic technique which is mastered by students in a form of psychotherapeutic workshops.